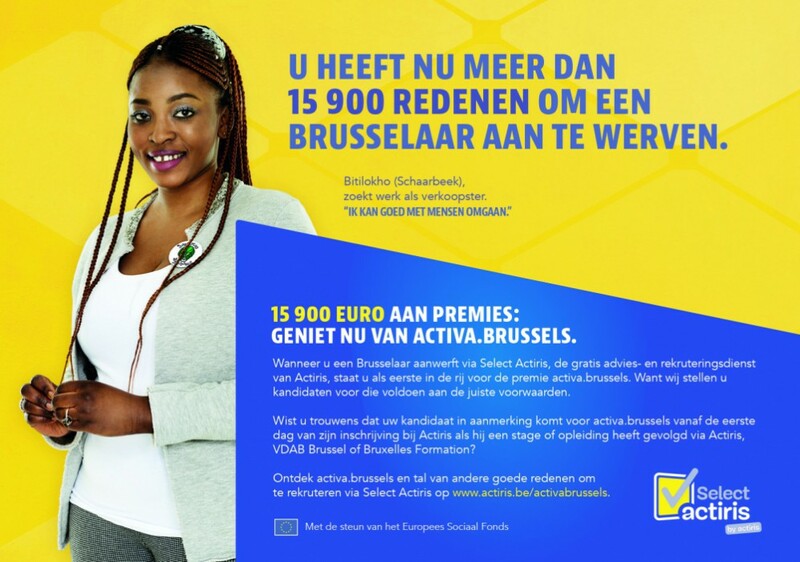 How we helped Actiris to make Brussels' employers proud to hire Brusselians again. The recruitment of talented employees is for employers always a big bite out of their budget. But on October 1st, a new measure was taken by the Brussels-Capital Region: activa.brussels. This measure allows employers to hire job seekers of Brussels at more advantageous conditions. They can receive up to € 15 900 in financial support when they hire a Brusselian. Select Actiris is all about helping employers to find the right employees. Together with Bonka Circus and Sprout To Be Brussels, Select Actiris launched a communication project that used this measure as a platform to stimulate employers to hire a job seeker from Brussels. At the same time, Select Actiris was positioned as a unique and dynamic service to support employers in doing this. The communication project ran again on radio, digital and outdoor. To make it extra credible, the campaign itself only showed real job seekers from Brussels, job seekers that were eligible for active Brussels.